At last it’s summer! Time to put some colour into our lives! While Mother Nature is decked out in all her glory, LOUIS ERARD is decorating ladies’ wrists with a line of bright, colourful timepieces. Designed for connoisseurs of fine mechanical watchmaking, this new line in the Emotion collection reflects the watchmaker’s credo to perfection and encapsulates its commitment to “Haute Horlogerie at affordable prices”, the enduring signature of all its creations. Offered in navy blue and violet to match a glamorous, summery look, the new Emotion takes on a slight air of extravagance in the cream-coloured version on a python strap. Housing an automatic mechanical movement, it presents a vibrant contrast between modernity, high technology and timeless elegance. To cater for other tastes, the steel version also comes with diamonds, 64 of them delicately set on the bezel. 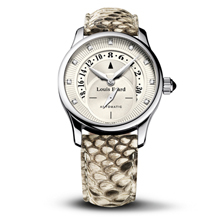 Another is decorated with nine diamond hourmarkers on the dial, adding a glittering facet to this summer jewel. 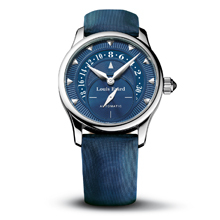 In keeping with the values that have built its reputation, LOUIS ERARD has fulfilled its mission by offering these new ladies’ timepieces at prices guaranteed to put you in a good humour! 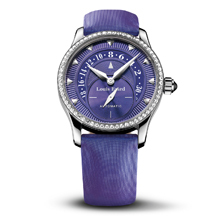 Strap : Satin navy blue or violet (tone-on-tone) or genuine python. Stainless steel folding clasp.